The Aardvark Jazz Orchestra marked its 46th Annual Christmas Concert with joyful music in the spirit of the season. The orchestra performed the premiere of music director Mark Harvey’s latest work, Healers of the Universe, a tribute to Boston social activist Kip Tiernan. The piece is a musical celebration of the new sculpture installed in Kip’s honor in Copley Square in October 2018. Inspired by quotations from her writings inscribed on the sculpture, the composition resonated with her life and work, intended to be a beacon of hope and humanity in these uncertain and turbulent times. Other music included What Child Is This, A Cradle in Bethlehem, and Mark Harvey’s Benedictus. Kip Tiernan was the founder of Rosie’s Place and co-founder, with Fran Froelich, of The Poor Peoples United Fund. Harvey’s earlier honorific piece, The Prophet, was performed at Kip Tiernan’s memorial service in September 2011 and, most recently, at the unveiling of the Copley Square sculpture. 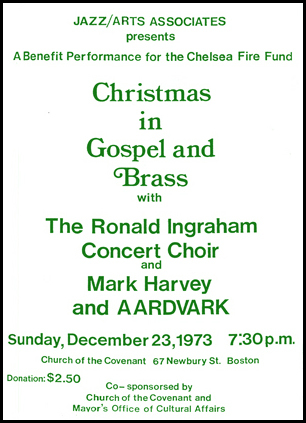 Led by founder/music director Mark Harvey, The Aardvark Jazz Orchestra gave its first concert December 23, 1973 at the Church of the Covenant in Boston as a benefit for the Chelsea Fire Fund. Every year since then, the band has held a Christmas concert to support a deserving cause. Past beneficiaries have included Doctors Without Borders, American Friends Service Committee, Rosie’s Place, Pine Street Inn, and many more. 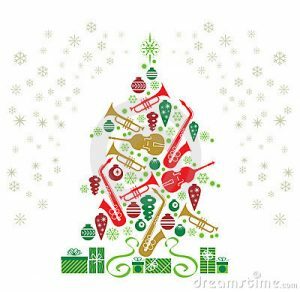 The Aardvark Christmas concerts have included illustrious guest artists Sheila Jordan, Howard McGhee, Semenya McCord, Ron Gill, Jack Powers, Kip Tiernan, Brother Blue and others.